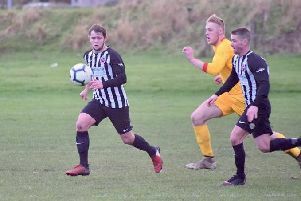 It was cold, it was very wet, but Alnwick Town continued their recent good form with a win on the road at Purvis Park on Saturday to make it four wins in a row. 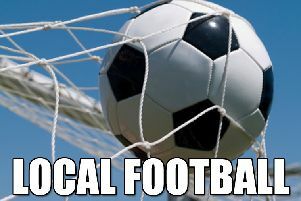 There was an impressive display at the back from Alnwick at Percy Main Amateurs, with a third consecutive clean sheet ensuring that the Wick moved closer to the top five places in the Northern Alliance Premier Division. Alnwick were pressing down the wings with Threlfall and Cunnigham, and looking to feed Colley and McClelland with through balls skipping along the wet surface. Opening chances fell to both strikers, but McClelland drilled an effort just wide, and Colley saw an effort saved by Mooney. Jonny Quinn almost broke the deadlock with a freekick outside of the box, but saw his effort curl away from the far post. Cameron Cunningham found Mooney in fine form to tip an effort over, but from the resulting corner Alnwick found themselves a goal up. Cunningham’s corner was met by Brendan Balmbra, who took a touch and fired into the bottom corner from around 10 yards out. There were 40 minutes on the clock and it was a goal for the visiting fans to cheer. Half time and Alnwick were ahead, and the Purvis Park pitch was starting to get heavy due to the persistent rainfall. With 54 minutes on the clock Alnwick thought they had doubled their lead. A long ball over the top was flicked on by Colley, who seemed to wrongfoot the goalkeeper, only to see his effort hit the post and roll along the front of the goal. McClelland was denied by Mooney once again seeing an effort tipped over, but he got his reward in the 84th minute and sealed the win for the away side, the ball falling kindly in the penalty area and being smashed home for his 11th goal of the season. As Percy pushed to get something from the game, they found a Town defence in no mood to let go of a clean sheet. Bodies were being chucked at efforts in the dying minutes by Balmbra and Dundas who were excellent in the centre of defence, along with Henderson and Drummond at full backs.